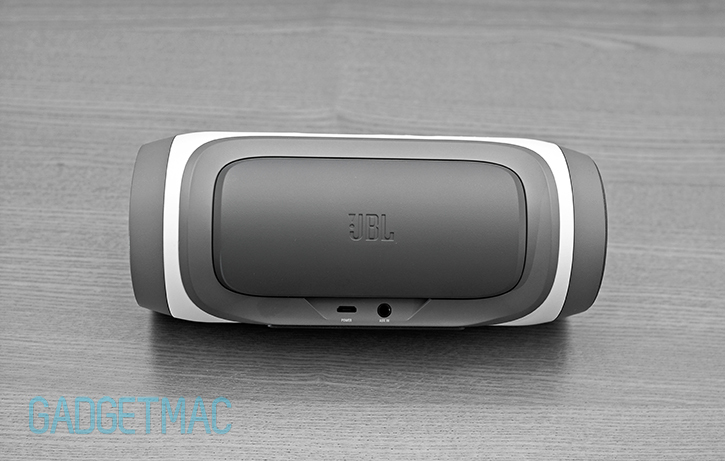 JBL's Charge sells itself as a portable wireless stereo speaker with impressive gadget-charging capabilities all rolled into one attractive and compact device. 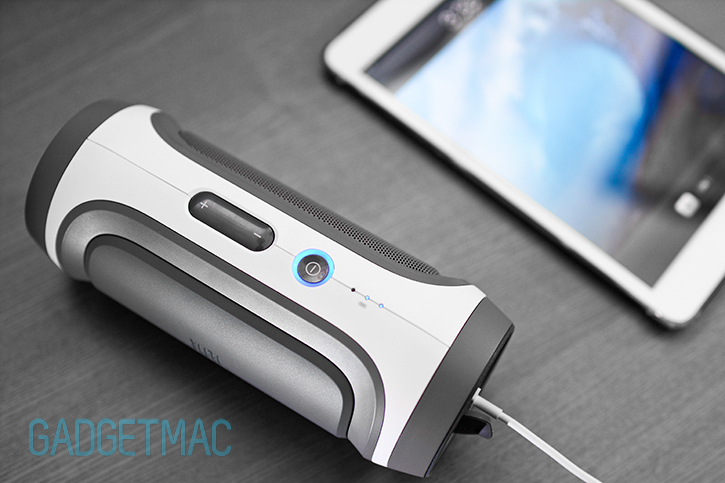 If there ever was a portable speaker that combined all-day long battery life, an ultra-fast backup battery charger with big sound in a small package - it would definitely have to be the Charge, and the Charge alone. As you might know, JBL gave us the $100 Flip late last year which at the time blew us away with its elite audio performance we called jaw droppingly powerful. But like any good product, the Flip had its inconveniences and treble-heavy sound signature we pleaded JBL to fix and improve upon. Now that we've got our hands all over the Charge, we're going to find out if JBL did things a little differently this time around. And it also means putting the Charge up against today's leading portable speakers. Want to see who comes out on top? So do we! Our full review is just around the corner. As an avid Flip user I think JBL's $150 Charge is not so much the Flip's successor but actually a speaker that answers additional needs that a lot of consumers have. But the Charge does this in a completely redesigned product that looks nothing like the Flip, albeit it does still share the same tube-like shape. Speaking of similarities, the Charge can also be used standing up or while it rests horizontally. The Charge is less executive-looking than the Flip is, and I really welcome its futuristic-esque pod design. It's got a design that visually conveys durability, and indeed it feels more robust than the Flip, however the build quality is neither better or worse. And that's a good thing since the Charge is made with durable grainy plastics which give the Charge a quality sturdy feel when held. The entire design is built around the speaker itself in a reinforced and recessed type of design which gives the Charge its seemingly ruggedized exterior. The front side is where the Charge houses its two 38mm full-range audio drivers which are protected and covered with a perforated metal grille similar to the Flip, although the Charge uses less of it in its construction respectively. The ends of the Charge might look like rubber made caps, but they're also made like the rest of the granular, matte textured plastic. The Charge comes in three colors including this gray with white trim, green with white trim and blue with white trim. The Charge is noticeably larger, or as some might even say bulkier than the Flip. Up against the UE Boom, the Charge is equal in width but also noticeably bulkier in diameter and certainly not as sleek in profile. In other words the Charge has a tough-to-crack type of a form factor you'd expect to find at REI. And still, it's a very portable speaker that'll fit into most gear bags and packs without issue. The difference is where the on-board controls are located. On the Charge, you'll fine the volume rocker button along with the unit's multi-function power on/off and Bluetooth pairing button positioned at the top instead of on the side which makes it easier to reach at all times. Next to the button controls is a row of three tiny LEDs which light up blue to indicate the remaining battery life of the Charge's built-in rechargeable battery. Not the most informative battery status gauge I must say and it's quite frustrating not knowing exactly how much percentage the Charge has left in it. I would have really liked seeing JBL copy the same kind of attention to detail of which Ultimate Ears have put into their UE Boom wireless speaker and its wonderful and most informative battery status indicators. And while we're at the topic, battery life is excellent and good for 12 hours of wireless streaming thanks to the massive 6000mAh of built-in rechargeable battery awesomeness the Charge sits on. That's a huge improvement over the Flip's 5 hours of wireless play time. Yet that's still not as impressive as the UE Boom's spectacular 15 hours of battery life. Similar to the Flip's button operation, an LED ring surrounding the power button of the Charge will flash between red and blue when in pairing mode, and later turn solid blue when turned on and connected to your device. One of the Charge's key features is its USB charging port which is located on its left side and is covered by a rubber flap. It's worth noting that around the edge is a rubber rim because this side of the speaker is also the bottom when placing the speaker on its upright position. You'll obviously need to place the Charge on its side when using the USB charging port which also features rubber feet. Audio quality will not be a affected by which orientation you place the Charge at. Plug into the Charge's USB charging port and it'll immediately start charging your iPhone, iPad, iPod or any other device for that matter, which is just a brilliant thing to have in a portable situation. The 6000mAh internal battery capacity is good for around 2 full iPhone 5 charges or enough to fill up an iPad mini back up to around 50%; and it can charge your device whilst playing your music, YouTube video or movie. JBL has failed to mention anything regarding the Charge's external battery charging capabilities, so we're not exactly sure how capable that 6000mAh battery really is. One thing is for sure though, the Charge only has that one 6000mAh battery meaning that if you use it to recharge your device, you may very well end up with no battery left to keep the speaker powered on to play your music. It charges fast, I mean very fast. I would venture to say that this is perhaps the most efficient backup battery charger I have tested that has managed to pump electricity into Apple devices faster than you can say thunderbolt. As an emergency backup battery feature, I think the Charge does above and beyond to flawlessly charge devices with plenty of juice. And if you use a fully charged up Charge to charge up a dead iPhone to its fullest, you'll still have loads of power left to keep on using the Charge as a speaker for a few hours. Portable speakers with such a feature makes perfect sense and is an extremely useful gadget-saving insurance when on the go. Looking behind the Charge we can see that JBL has finally put a micro-USB charging port for charging the speaker using a USB cable. Right beside it is a 3.5mm auxiliary audio input for use with non-Bluetooth enabled devices. The rest of the Charge's nicely sculpted backside is just solid plastic. This means that you can now conveniently charge the Charge straight off of a USB port on your computer or any compatible USB charging adapter for that matter, an option which wasn't available on the Flip. One of the biggest downsides with the Flip was its unconventional charging plug which had to be plugged into a wall outlet instead of using a USB power source. It required you to lug with you a clunky AC power adapter. The same AC adapter design is also included with the Charge mind you, only that this model support detachable USB cables instead. If I had one knock about the included accessories (not shown) it would be the Charge's USB to micro-USB charging cable which is thick beyond its necessary durability requirements and clunky, nowhere near as good and compact as the flat USB charging cable included with the UE Boom for example. The same could be said about the included USB wall power adapter which is huge by today's standards, and poorly designed by JBL. With that said, the Charge includes the same type of form-fitting neoprene carrying case as the Flip. Charging that 6000mAh internal battery takes quite a while I've found. Around 5-6 hours to charge over USB, well over the stated duration. However, it takes less time charging when plugged into a wall outlet using the supplied wall adapter. 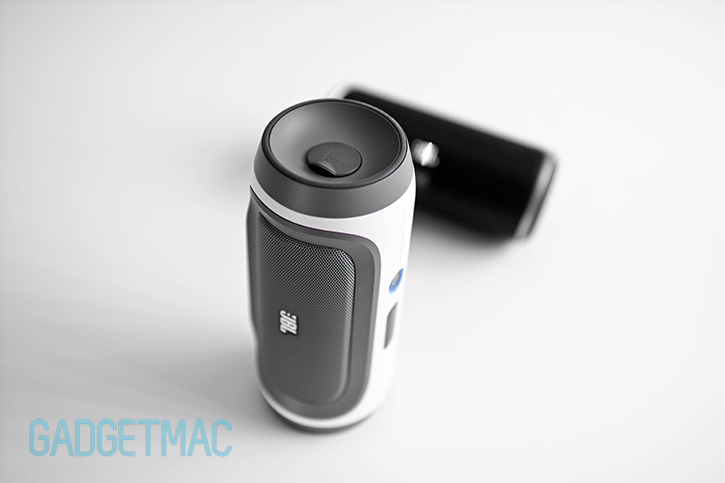 Unlike the Flip's slanted upright standing, the Charge stands totally straight up with its speakers facing forward similar to how the UE Boom is used. Audio isn't directed more towards your face if you're standing up above the speaker, but at the same time the Charge manages to output enough loud audio that it's an insignificant outcome when comparing it up against the Flip. The highlight of it all mostly revolves around the Charge's newly designed built-in bass port which JBL claims delivers impressive, unrivaled bass. To that I say...not entirely correct. The bass port is located right at the top of the Charge and noted as such by its perforated metal grille. Put your hand over it and you'll definitely feel the air pushing out so it does serve its function, but how well you ask? Sonically, the Charge unsurprisingly sounds just as great and is just as powerful as the Flip, however, it beats the Flip by a small margin and nearly matches up with the UE Booms sound quality in terms of clarity and overall richer more balanced sound thanks to the improved bass response which the Flip lacked. Inside, the Charge shares the same hardware specifications as the Flip with one minor exception which is the side-firing bass port as oppose to it facing backwards on the Flip. Whatever JBL has done with this design change looks to have worked to improve the bass response as we have mentioned earlier. Keep in mind that the bass isn't as exceptional as JBL wants you to believe. It is good as far as these small speakers go, but it's far from exceptional or even thumpy as we like to refer to great bass. Just to be clear if we weren't already, the Charge and the UE Boom both surpass popular rivals such as the Beats Pill, Braven 600 and of course the Jawbone Jambox when it comes to audio performance. Though we've got a good feeling that Bose's upcoming SoundLink Mini will unbalance things out. While we're on the subject, the Charge stands up against the Braven suite of wireless portable speakers which all feature power banks capable to charging external devices. One thing the Charge does differently however is that it shares its 6000mAh battery when wanting to charge an iPhone for instance, instead of using two separate internal batteries like Braven which I should note have much smaller capacities - only 1400mAh in the comparable $150 Braven 600 model. But don't be confused because the UE Boom by Ultimate Ears is still the best portable speaker you can get in terms of sound quality. And the $50 price difference should make you think hard whether or not you need a battery charging feature in your portable speaker, or just the best possible sound experience you can get for $200. Choosing which of the two to go for is simple. 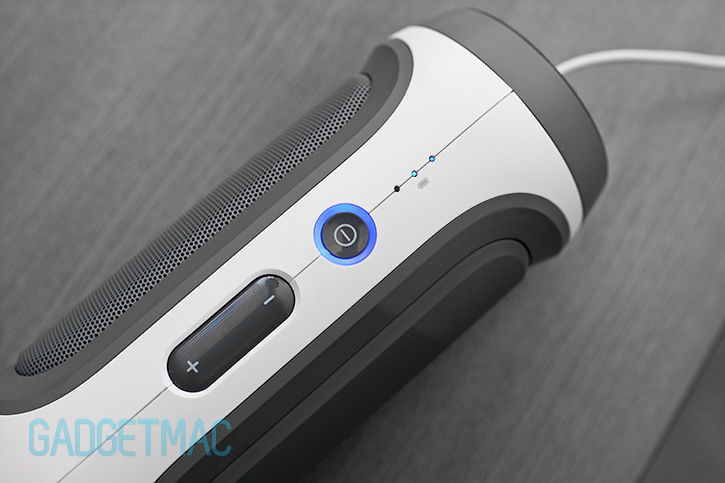 The UE Boom is more expensive, but rightfully so. It's water-resistant, has NFC built in along with a few other highly polished features, and it spits out impressive 360 degree audio not to mention impressive industrial design. It's the wireless speaker to get for $200 if you're looking for the complete package. But, if you find yourself in need of something more like the Charge's ability to share its massive internal rechargeable battery with your devices, then at the $150 mark the Charge offers a compelling set of skills coupled with powerful audio that sounds better than any other portable speaker below the $200 price level. The Flip is still a fantastic little speaker for $100 and we'd recommend it if you like very bright sounding audio on a tight budget, but it come with its fair share of tradeoffs. There were a few downsides which prevented us from awarding the Flip with our Editors' Choice Award. We felt that the lack of USB charging capabilities and bass presence were two caveats that prevented the Flip from becoming one of our favorite products that we'd personally use. And because these two nuisances were improved upon with the Flip's much improved older brother, JBL's Charge is worthy of our Editors' Choice Award for performing excellent in the sound department and as a portable speaker with a fantastically useful backup battery charging feature we found came in handy on more than one occasion. And that's exactly why someone would consider getting the Charge over other portable wireless speakers. Whichever model you end up going with, we hope that you enjoy your portable, wireless audio goodness wherever it is you'll be.